Aeroponics is the process of growing plants in an air or mist environment without the use of soil or an aggregate medium (known as geoponics). The word "aeroponic" is derived from the Greek meanings of aero- (air) and ponos (labour). Aeroponic culture differs from both conventional hydroponics, aquaponics, and in-vitro (plant tissue culture) growing. Unlike hydroponics, which uses a liquid nutrient solution as a growing medium and essential minerals to sustain plant growth; or aquaponics which uses water and fish waste, aeroponics is conducted without a growing medium. Because water is used in aeroponics to transmit nutrients, it is sometimes considered a type of hydroponics. The basic principle of aeroponic growing is to grow plants suspended in a closed or semi-closed environment by spraying the plant's dangling roots and lower stem with an atomized or sprayed, nutrient-rich water solution. [not in citation given] The leaves and crown, often called the canopy, extend above. The roots of the plant are separated by the plant support structure. Often, closed-cell foam is compressed around the lower stem and inserted into an opening in the aeroponic chamber, which decreases labor and expense; for larger plants, trellising is used to suspend the weight of vegetation and fruit. Due to the sensitivity of root systems, aeroponics is often combined with conventional hydroponics, which is used as an emergency "crop saver" – backup nutrition and water supply – if the aeroponic apparatus fails. High-pressure aeroponics is defined as delivering nutrients to the roots via 20–50 micrometre mist heads using a high-pressure (80 pounds per square inch (550 kPa)) diaphragm pump. Benefits of oxygen in the root zone: Oxygen (O2) in the rhizosphere (root zone) is necessary for healthy plant growth. As aeroponics is conducted in air combined with micro-droplets of water, almost any plant can grow to maturity in air with a plentiful supply of oxygen, water and nutrients. Some growers favor aeroponic systems over other methods of hydroponics because the increased aeration of nutrient solution delivers more oxygen to plant roots, stimulating growth and helping to prevent pathogen formation. Clean air supplies oxygen which is an excellent purifier for plants and the aeroponic environment. For natural growth to occur, the plant must have unrestricted access to air. Plants must be allowed to grow in a natural manner for successful physiological development. The more confining the plant support becomes, the greater incidence of increasing disease pressure of the plant and the aeroponic system. Some researchers have used aeroponics to study the effects of root zone gas composition on plant performance. Soffer and Burger [Soffer et al., 1988] studied the effects of dissolved oxygen concentrations on the formation of adventitious roots in what they termed “aero-hydroponics.” They utilized a 3-tier hydro and aero system, in which three separate zones were formed within the root area. The ends of the roots were submerged in the nutrient reservoir, while the middle of the root section received nutrient mist and the upper portion was above the mist. Their results showed that dissolved O2 is essential to root formation, but went on to show that for the three O2 concentrations tested, the number of roots and root length were always greater in the central misted section than either the submersed section or the un-misted section. Even at the lowest concentration, the misted section rooted successfully. Other benefits of air (CO2): Plants in a true aeroponic apparatus have 100% access to the CO2 concentrations ranging from 450 ppm to 780 ppm for photosynthesis. At one mile (1.6 km) above sea level, the CO2 concentration in the air is 450 ppm during daylight. At night, the CO2 level will rise to 780 ppm. Lower elevations will have higher levels. In any case, the air culture apparatus offers the ability for plants to have full access to all of the available CO2 in the air for photosynthesis. Growing under lights during the evening allows aeroponics to benefit from the natural occurrence. Disease-free cultivation: Aeroponics can limit disease transmission since plant-to-plant contact is reduced and each spray pulse can be sterile. In the case of soil, aggregate, or other media, disease can spread throughout the growth media, infecting many plants. In most greenhouses, these solid media require sterilization after each crop and, in many cases, they are simply discarded and replaced with fresh, sterile media. [not in citation given] A distinct advantage of aeroponic technology is that if a particular plant does become diseased, it can be quickly removed from the plant support structure without disrupting or infecting the other plants. Basil grown from seed in an aeroponic system located inside a modern greenhouse was first achieved 1986. Due to the disease-free environment that is unique to aeroponics, many plants can grow at higher density (plants per square meter) when compared to more traditional forms of cultivation (hydroponics, soil and Nutrient Film Technique [NFT]). Commercial aeroponic systems incorporate hardware features that accommodate the crop's expanding root systems. Researchers have described aeroponics as a "valuable, simple, and rapid method for preliminary screening of genotypes for resistance to specific seedling blight or root rot.”  The isolating nature of the aeroponic system allowed them to avoid the complications encountered when studying these infections in soil culture. Water and nutrient hydro-atomization: Aeroponic equipment involves the use of sprayers, misters, foggers, or other devices to create a fine mist of solution to deliver nutrients to plant roots. Aeroponic systems are normally closed-looped systems providing macro and micro-environments suitable to sustain a reliable, constant air culture. Numerous inventions have been developed to facilitate aeroponic spraying and misting. The key to root development in an aeroponic environment is the size of the water droplet. In commercial applications, a hydro-atomizing spray at 360° is employed to cover large areas of roots utilizing air pressure misting. A variation of the mist technique employs the use of ultrasonic foggers to mist nutrient solutions in low-pressure aeroponic devices. Water droplet size is crucial for sustaining aeroponic growth. Too large a water droplet means less oxygen is available to the root system. Too fine a water droplet, such as those generated by the ultrasonic mister, produce excessive root hair without developing a lateral root system for sustained growth in an aeroponic system. [not in citation given] Mineralization of the ultrasonic transducers requires maintenance and potential for component failure. This is also a shortcoming of metal spray jets and misters. Restricted access to the water causes the plant to lose turgidity and wilt. Advanced materials NASA has funded research and development of new advanced materials to improve aeroponic reliability and maintenance reduction. It also has determined that high pressure hydro-atomized mist of 5-50 micrometres micro-droplets is necessary for long-term aeroponic growing. For long-term growing, the mist system must have significant pressure to force the mist into the dense root system(s). Repeatability is the key to aeroponics and includes the hydro-atomized droplet size. Degradation of the spray due to mineralization of mist heads inhibits the delivery of the water nutrient solution, leading to an environmental imbalance in the air culture environment. Special low-mass polymer materials were developed and are used to eliminate mineralization in next generation hydro-atomizing misting and spray jets. 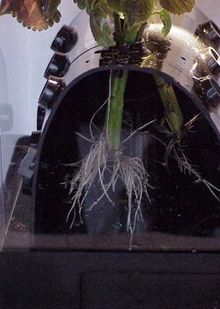 Nutrient uptake: Close-up of roots grown from wheat seed using aeroponics, 1998 The discrete nature of interval and duration aeroponics allows the measurement of nutrient uptake over time under varying conditions. Barak et al. used an aeroponic system for non-destructive measurement of water and ion uptake rates for cranberries (Barak, Smith et al. 1996). In their study, these researchers found that by measuring the concentrations and volumes of input and efflux solutions, they could accurately calculate the nutrient uptake rate (which was verified by comparing the results with N-isotope measurements). After verification of their analytical method, Barak et al. went on to generate additional data specific to the cranberry, such as diurnal variation in nutrient uptake, correlation between ammonium uptake and proton efflux, and the relationship between ion concentration and uptake. Work such as this not only shows the promise of aeroponics as a research tool for nutrient uptake, but also opens up possibilities for the monitoring of plant health and optimization of crops grown in closed environments. Atomization (>65 pounds per square inch (450 kPa)), increases bioavailability of nutrients, consequently, nutrient strength must be significantly reduced or leaf and root burn will develop. Note the large water droplets in the photo to the right. This is caused by the feed cycle being too long or the pause cycle too short; either discourages both lateral root growth and root hair development. Plant growth and fruiting times are significantly shortened when feed cycles are as short as possible. Ideally, roots should never be more than slightly damp nor overly dry. A typical feed/pause cycle is < 2 seconds on, followed by ~1.5-2 minute pause- 24/7, however, when an acumulator system is incorporated, cycle times can be further reduced to < ~1 second on, ~1 minute pause. As a research tool: Soon after its development, aeroponics took hold as a valuable research tool. Aeroponics offered researchers a noninvasive way to examine roots under development. This new technology also allowed researchers a larger number and a wider range of experimental parameters to use in their work. The ability to precisely control the root zone moisture levels and the amount of water delivered makes aeroponics ideally suited for the study of water stress. K. Hubick evaluated aeroponics as a means to produce consistent, minimally water-stressed plants for use in drought or flood physiology experiments. Aeroponics is the ideal tool for the study of root morphology. The absence of aggregates offers researchers easy access to the entire, intact root structure without the damage that can be caused by removal of roots from soils or aggregates. It’s been noted that aeroponics produces more normal root systems than hydroponics.